"Schmitt, You and Me," video installation, 55' loop, 2016-2017. Room Gallery is proud to present Omar Mismar’s video installation Schmitt, You and Me as part of the UAG’s Emerging Artist Series, curated by Juli Carson. Mismar’s body of work – equally influenced by conceptual art, critical studies and design – is project driven. His process entails drifting through a given city, clinging parasitically onto different frameworks and situations, wherein he forms temporary alliances to the space and the publics he encounters. 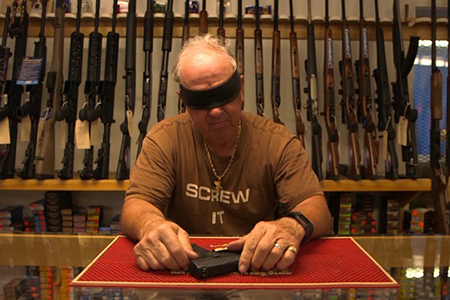 His latest video installation, Schmitt, You and Me, is a result of one such “drift.” While residing in Skowhegan, Maine, Mismar frequented a local gun shop, hanging out with its owner Bruce and shop manager Bailey. The two eventually took their new friend to a shooting range, giving him a crash course on guns and aiming. In turn, Mismar asked Bruce and Bailey if they would read excerpts from Carl Schmitt’s 1932 text The Concept of the Political on camera from their shop. At times humorous, at others serious, Schmitt, You and Me breaks all stereotypes, providing a portal into the country's current psycho-political conflict. We can read this mise-en-scène – Mismar’s performative return to Schmitt – through Chantal Mouffe’s lens of “radical democracy,” a theory founded on the ethics of agonistic politics in lieu of moralist consensus. For Schmitt, The Concept of the Political is that which defines friend from enemy, ultimately resulting in the act of war. However, like many contemporary nation-states, Schmitt’s text troubles the reader, oscillating between certitude and ambivalence. Mouffe’s On the Political argues "with Schmitt against Schmitt" to conceive of his friend/enemy relationship quite differently. For Mouffe, the antagonistic relation is an ever-present possibility that cannot and should not be overcome. Instead of the friend/enemy eradicating one another, Mouffe proposes an agonistic relation that can be democratically articulated in different ways. As Mouffe puts is: “What democracy requires is drawing the we/they distinction in a way that is compatible with the recognition of the pluralism which is constitutive of modern democracy.” Simply, when we note the legitimacy of our opponents – when we see “them” as belonging to the same political association and sharing a common symbolic space – we avoid war. In Schmitt, You and Me, Mismar’s collaborators have great difficulty uttering Schmitt’s archaic language, but nevertheless they speak Schmitt’s intentionality. As these protagonists read and re-read the historic but ambiguous text, we as viewers sense the entrapment that Schmitt’s ideas still create for us today, a cul-de-sac that Bruce and Bailey admittedly encounter themselves. In the end, they are compelled to ask: Does Schmitt provide a solution to the friend-enemy-possibility-of-war concept? It’s an apt question in our current geo-political crisis. And it’s one that Mismar’s art practice poetically begs us to ponder as a critical, ethical act of democratic resistance. Omar Mismar is a visual artist born in Lebanon. He holds an MFA in Fine Arts and an MA in Visual and Critical Studies from California College of the Arts. Mismar has taught at the American University of Beirut, the University of San Francisco, and California College of the Arts. Monday, October 9, 12:00 - 1:30 p.m.